A rooster that needs glasses? Are you kidding? Spencer crows at the moon and the yard light. The hens Bernaise, Mornay and Hollandaise cluck their disapproval, and the hired hand throws shoes. Everyone tells Spencer to get with it. Does someone need an alarm clock? Or a vacation? Will he see the sun? 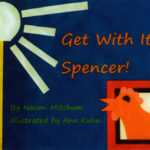 Find out why the moo-a-doodle-do, the bray-a-doodle-do and the oink-a-doodle-do aren’t good crowing substitutes for Spencer while he is gone, and watch for his return with a big, red plaid case tucked under his wing. Now when will he crow? 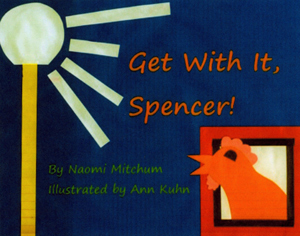 This book is especially great for children who wear glasses, but fun for everyone. Reading to young children will be fun for parents and grandparents, and children will be laughing so hard they forget to bray-a-doodle-do.